Think You Can't Afford Solar Panels on Your Home? Think Again. Many green-minded consumers would love to have solar panels sucking down the sun's rays every day to partially offset their power bill, or even eliminate it altogether, but they're put off by the high front-end costs of a solar array. In today's market, a five kilowatt system would cost around $35-45,000, if a homeowner were to pay for everything out of his or her pocket. 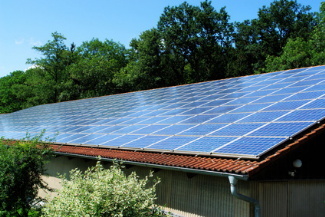 Fortunately, many utilities offer generous incentives to homeowners who want to install solar arrays, and there is still a federal tax credit program that can offset up 30% the total costs, so a consumer who wanted to install a solar array on the family casa might be looking spending only around $10,000 for a complete system, including solar panels, an inverter (for converting the solar energy into the A/C electricity that most homes use), and installation. However, buying your system outright is not the only solution to getting solar power installed at your home. For instance, have you looked into leasing a solar array? According to a story that was recently broadcast on NPR SolarCity, a California-based solar energy company, allows customers in certain, select states to lease their equipment, rather than laying out the huge expense of buying and installing a solar array. The advantage to leasing solar panels is that consumers often don't have to pony up one dime to have a system installed, and then the leasing fee they pay is frequently much less than they'd pay out in electric bills. So, over the course of a year, there's a net savings to the consumer. Then, when the lease is up, consumers have the option to buy the solar array on their homes at a reduced price. What makes this an attractive option for consumers wanting to decrease the size of their carbon footprint, is that they can do so without big upfront costs. This makes what SolarCity is offering, a win-win for consumers and for the environment. Every home that can derive some or all of its power from renewable resources means there is that much less stress placed on existing power grids and a little bit less coal or oil that has to be purchased to run the generators. The only drawback to what SolarCity is providing is that their solar panel leasing arrangement is not available in every state in the U.S... At this time, consumers can get tax rebates and incentives from California, Arizona, New York, New Jersey, Pennsylvania, Massachusetts, Hawaii, Colorado, Washington D.C., Oregon, and Texas. In states where the right kind of tax rebates and incentives are not available, SolarCity does not provide their services, and consumers should look at other solar energy providers in their home state that may provide leasing arrangements similar to what SolarCity can do. Another advantage to using SolarCity's leasing arrangements is some leasing arrangements include maintenance of your system - which is nothing to sneeze at. Repairs on solar power systems can get expensive, to say nothing of the trouble of running down an electrician with experience repairing and maintaining solar arrays. The firm also provides continuous monitoring of your solar power array and will respond quickly in the event of a power outage due to equipment failure. Plus, SolarCity provides insurance coverage against things like hail or wind damage or theft. So, really, on balance, it makes a great deal of sense to look into leasing a solar array instead of buying one. But, whatever you decide to do for your power needs, using renewable resources is much saner choice than continuing to rely on power that comes from dirty, expensive fossil fuels.